Like blowing out candles on a birthday cake, only more dramatic, this set encourages users to dream big. Like blowing out the candles on a birthday cake, only a lot more dramatic, this activity set encourages users to dream big, then let the wind blow them where it may. Simply write your hopes, wishes, and what-ifs on the wish paper and roll into a tube. A bright "wish platform" becomes the staging ground for your inspiration--place the tube of paper on the pad, then light the top edge of your wish. As your wish burns, the ashes scatter in the wind, carrying your thoughts with them. Want to wish on something more specific? This set includes a guide to the seven Chakras--the body's seven primary energy centers, according to Eastern philosophies. Write a Chakra in need of balancing on your flying wish paper to encourage good energy to come your way. Made in the Portland, Oregon. 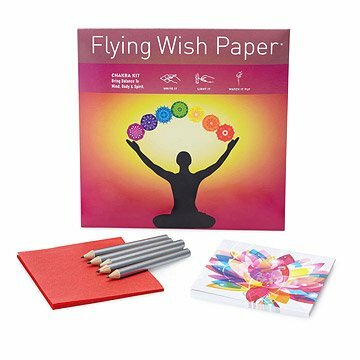 Chakra Flying Wish Paper Kit includes 50 flying wish papers, 25 wish platforms, 5 pencils, and instructions. Matches not included. Not intended for use by children. Burn on platform card provided. Never leave fire unattended. Chakra Flying Wish Paper Kit is meant for indoor use. I gave this gift to a friend who was going through a hard time and it touched her deeply. Although I am not using the product as I purchased and had it mailed to our boss, she was very happy and excited to receive it. When these are used in the evening, they are delightful and everyone can send one up. I sent my sister "50" special items for her 50th Birthday and this was one of them. It makes a very unique and special gift. Great way to add a little fun.